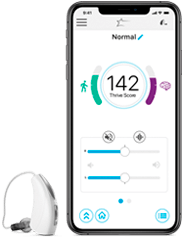 A4i iQ, Audibel's latest smartphone compatible hearing aids, have advanced technology that make speech sound more natural and easier to hear in today's complex listening environments. Nearly one in five, age 12 and older—experience hearing loss severe enough to hinder communication. Over time, reduced stimulation to your ears and brain can actually impair the brain's ability to process sound and recognise speech. Hearing impairment is only partially recoverable with hearing aids.